It might have been the wettest summer in living memory, but down in Gortnanain, Ultan and Lucy’s farm, one new development has been a great success. Ultan got into bees earlier this year. And when this man gets into something, he gets in deep. After a period of thinking that this was hobby too far, curiosity got the better of me and I donned a beekeeper suit too and went down to the corner of the field now known as the apiary. They say that the first time you approach 40,000 bees you either become obsessed or run away screaming. 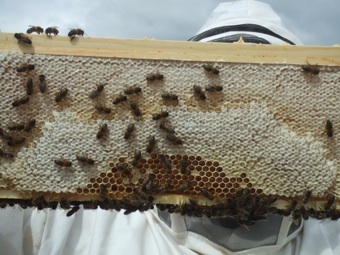 My heart was beating too fast but from the second I held the first ‘super’ of bees clinging to their summer’s work I knew I wanted to know more, do more with them, and ultimately have my own hive of bees. That’s for another day and we’ll have to wait to see if it develops into full blown obsession. But for now, this honey season is over, the bees are hunkering down trying to keep warm, the few that will survive the winter at least. Last Friday, Ultan delivered a five kilo tub of honey to Paradiso, a bucket of shimmering, golden syrupy liquid, fragrant with the subtle hint of the wild flowers of hedgerows and clover. What to do with it? I have a lot to learn about cooking with honey, and the thought process is the same as with any precious local ingredient – figuring out how to do more than merely use it, to give it a prominent role. We’ll start by drizzling it over the breakfast yoghurt & fruits, making dressings for the grilled figs, leaves and beetroot, spooning it over the blue cheese on the dessert menu. Deeper into the autumn, it will make fantastic glazes and sauces for root vegetable tagines and roasts. And privately, I’ll be bringing it to bed. There’s nothing quite like a honey hot whiskey and a good book. Any other suggestions? Hello Dennis – How about sautéed aubergine with onions and honey, or a sorbet with cucumber and honey…NICE! Thanks, Shiveringgoat! Aubergine, onion and honey sounds weird as anything but last night, faced with some grilled aubergine and a bag of pasta, your suggestion came into my head. So I made a pasta sauce with the aubergine, fried onion, dates, pinenuts and some spices, then spooned in some honey at the end. It was intense and incredibly satisfying, with a long, long lingering taste of sweetness and spice. That’s the first recipe of the next book sorted!